"Can you find all the Easter eggs and help the Easter Bunnies get through the maze to escape from the wolf? Join in the fun with the Easter Bunnies and shout 'Hooray for Easter Day!' This super activity book is bursting with colouring, puzzles, games and over 100 lovely stickers. 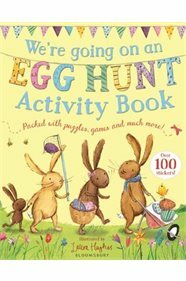 Based on the bestselling We're Going on an Egg Hunt, the little ones will have plenty to keep them occupied over the Easter holidays. Laura Hughes' beautiful illustrations jump off the pages of this activity book and children will adore the cute springtime animals."